The ends of my fingers hurt, it's too much stitching with thick rough wool, through thick heavy fabrics, so I’m pausing the embroidery to write. I’m in the Whaley Bridge Library today for the project Stitching the Wars. I’ve just had a long conversation with a library regular Graham, he’s an ex- postie, whose stories included the tale of his sponsored walking backwards from Lands End to John O Groats. 30 miles a day backwards, I would find 15 forwards difficult! It seemed much of the pleasure for Graham was in the people he encountered along the way. A delight I share in- this project like so many of arthur+martha’s give opportunities to meet such a range of people- hear their stories- and reflect them back to a wider audience. In the last year I’ve had the privilege to meet a Bevin Boy, a Lumber Jill, a number of Land Girls, countless farmers, an Air Gunner, railway men, lecturers, nurses, WAAFs and regular Joes whose ordinary life’s during and post World War 2 seem extraordinary now. 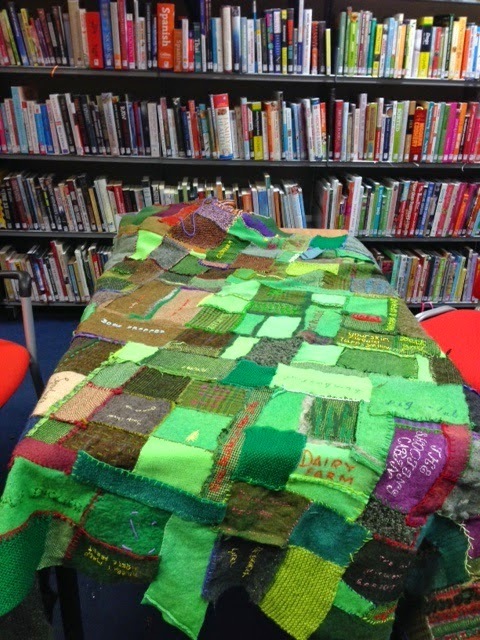 Stitching the Wars quilt, work in progress at Whaley Bridge Library. The Stitching the Wars quilt exhibits many voices, shares many hands. Some people just want to talk, others will hand write snippets of reminiscence and poetry, others carefully stitch these memories onto fabric, others stitch memory to memory. Its slowly, slowly coming together. A little bit of discomfort in my fingers is a small price to pay… at least it wasn’t 30 miles backwards. Thanks to everyone who gave their time today and to Jake and Jude for the very welcome cups of tea.